The Nordic half round gutter system, watch Jan explain the awesome features and benefits of the half round gutter system from Lindab. This is a short film sequence to get the basic facts of probably the best half round steel gutter system in the world. You will barely believe how quick this half round gutter system is to install. In essence, once you have put up the hangers the rest is plug and play. Uniquely you fit the end cap on in seconds and snap in the sections of half round gutter equally fast. You connect them with the gutter connector in seconds without any need for caulk. The extreme durability of the EPDM rubber in the end cap, and the gutter connector, seals tight. EPDM has many very good properties, some are its outstanding heat, ozone, and weather resistance. The EPDM life expectancy is equal to that of the complete system. The 20 year non prorated warranty include all components and accessories of the half round gutter system. You never put caulk in this half round gutter system. Not to mention you do not penetrate gutters, downspouts or outlets with screws. Avoiding this reduces the risk of preventing good water flow and absolute points of leakage. There are many advantages of the Lindab half round gutter system. The GreenCoat® paint finish is state of the art. It is the most ECO friendly product of high quality, color coated steel, for exterior building applications. GreenCoat® is also one of the most comprehensive for the entire building industry. Not to mention, the paint system features Bio-based Technology where traditional fossil oil is replaced by rapeseed oil. This is absolutely unique on the market and makes it extremely green. Additionally, this patented color system offers tremendous environmental advantages, as well as increased performance. Generally speaking, the quick installation, the perfect fit of the products, the rigid and very strong system, coating on all surfaces, both inside and out. 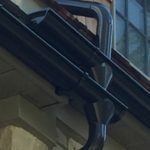 In summary, this aesthetically appealing half round gutter system installed looks and works second to none, and is truly world class.